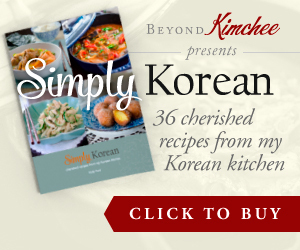 You are here: Home > Archives > Recipes > Korean Recipes > Main Dishes > Bibimbap, fit for a king or a farmer? Bibimbap, fit for a king or a farmer? What can I say more about Bibimbap? It is one of the most well known Korean dish, and I never met anyone yet who doesn’t like it. I know I should zip up my lips and go straight to the tutorials, but I gotta put my personal opinion on this dish. I don’t like chunks of meat added in my Bibimbap. I am not a vegetarian nor a rabbit but I like my Bibimbap to be herbivore worthy, except a tiny bit of ground beef melted in then Chili Bibim Sauce I posted just a few days ago. Nobody is exactly sure how or where this dish was originated. Some says it was served to the kings as a simple lunch in the palace (not so simple work for the royal cooks), the others believe it was for farmers who had to eat their lunch at the rice field, mixing everything in a bowl for a quick meal, in order to return to the field. There are other theories as well, but whichever story is right, whether Bibimbap was for the kings or farmers, it has continued its heritage all the way. 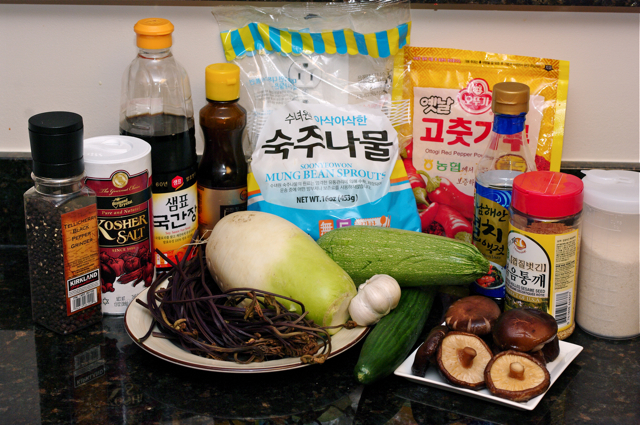 Every region in Korea have developed their versions by using variety of vegetable dishes called “namool (나물)”. 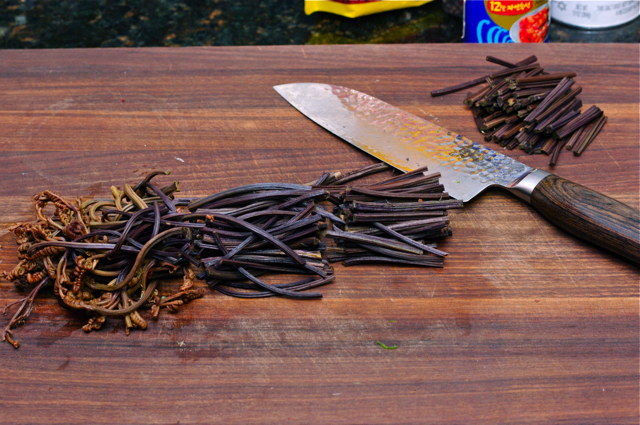 Each seasoned separately to bring their unique flavors. I used 6 vegetables this time. From the red color to clockwise, radish, shitake mushroom, zucchini, mungbean sprouts, fern, cucumber. You can always choose other types of vegetables such as spinach, carrot, lettuce, soy bean sprouts, eggplants, squash, etc. Color is important in the dish. Eat with eyes before eat with mouth. Think of contrast in vegetable colors. 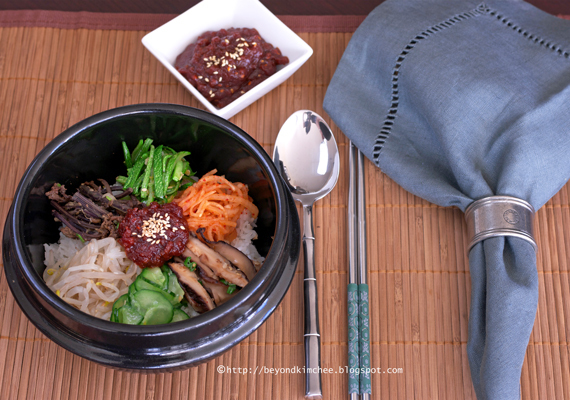 If you want to impress your family and friends, serve Bibimbap for lunch. I occasionally serve this dish to my guests and they all loved it. The good news is that you can prepare these vegetables a day advance so all you need to do on the day of luncheon is to cook rice and fry some eggs if you like. The dish can feed lots of people depends on how much vegetable you use. No need to worry about other dishes to go with. This is the ideal one dish meal. It takes some time to prepare but impressive yet healthy and delicious. The hardest part of my job is trying to list everyone in the photo. I won’t name this time. If you have been following me, you know my cooking crew by now. Contact me if you have questions on the ingredients. The long brown thingy next to the radish is fern. 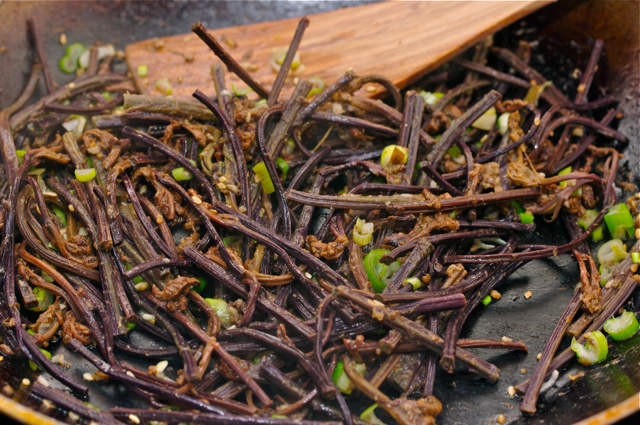 고사리(Gosari), the dried Fernbrake , is dried wild fern. 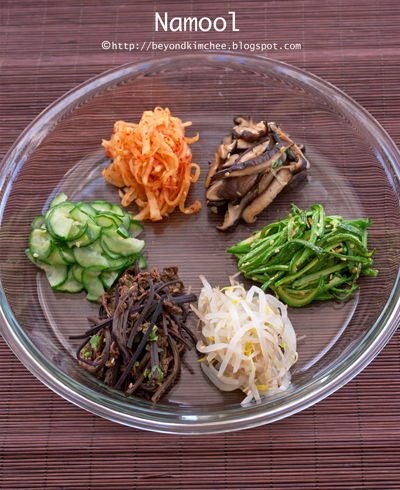 Very typical vegetable in traditional Bibimbap dish. If you can’t find it, then forget about it. Soak mushrooms and ferns in the water. Mushrooms can get out of water in 2-3 hours but the fern has to stay in overnight. They are very, very dehydrated. Now, it is time to make loads of Namool! Peel the radish. Slice thinly and cut into 1/8″ sticks. Add 2 tsp salt and 2 tsp sugar. Let it sit for 10 minutes. You will see some moisture has been extracted. Rinse and drain the radish. 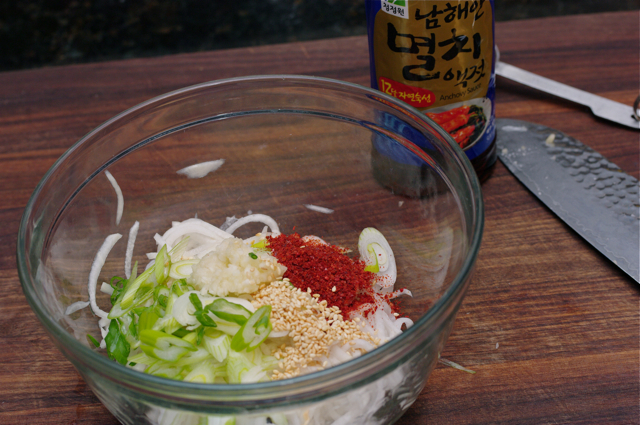 Add 1 Tbsp anchovy sauce, garlic, chili flakes, sesame seeds, chopped green onions(optional). Toss well with hand. Set aside. #1 done! Cook mung bean sprout in boiling water for 3 minutes, drain. 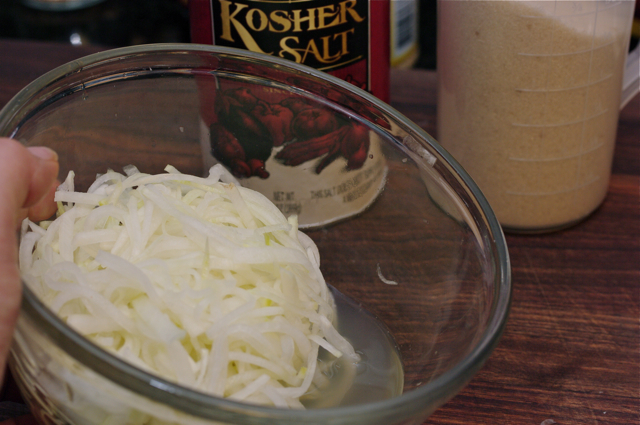 Toss with salt, sesame oil, sesame seeds, garlic, Korean soy sauce and shrimp powder (optional). Set aside. #2 done! 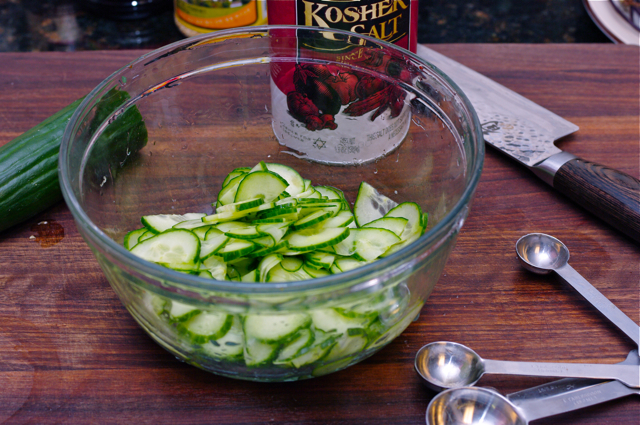 Slice the cucumber very thinly. Sprinkle some salt and let it sit to wilt for 10 minutes. Rinse and drain. Saute in a little bit of oil, add pinch salt and sesame seeds. Make sure you keep their vibrant green color. #3 done! 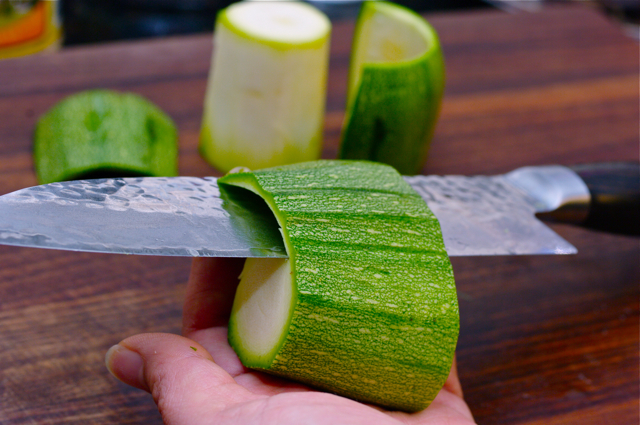 Cut zucchinis into 2″ logs and peel the green part of the skin carefully from the side. Discard the white part. Slice them into about 1/4″ sticks. If you are not comfortable peeling off the skin, just slice the whole zucchini into whatever size you like. Saute them in oil, add salt, garlic, sesame oil, and sesame seeds until they get softened yet still green. #4 done! 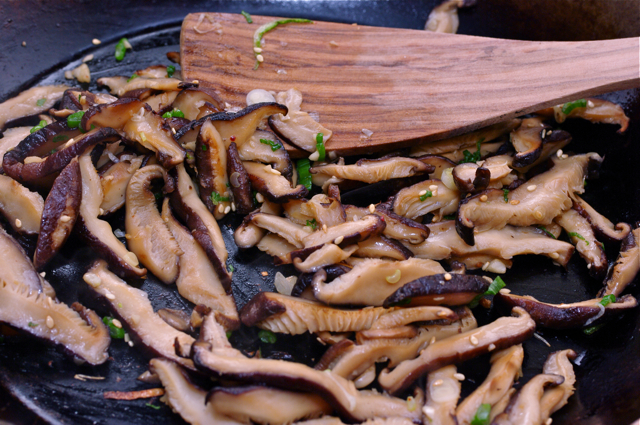 Remove the stem of mushrooms and slice them into strips. Saute them in oil with 1 tsp Korean soy sauce, garlic, sesame seeds and some chopped green onion. #5 done! Once the fernbrake are re-hydrated, you need to cook them in simmering water for 40 minutes to soften. Drain and cut off about 2″ off from the stem ends part. They are too woody! Place them in a bowl, add 1 Tbsp Korean soy sauce, garlic, and shrimp powder (optional), and sesame oil. Toss them well with hand. Saute them as well until slightly tender. Add some green onion and sesame seeds. #6 done! Whew!!!! That’s all for the vegetables. You can make these ahead of time and store in the fridge. Just bring to the room temperature before you serve. 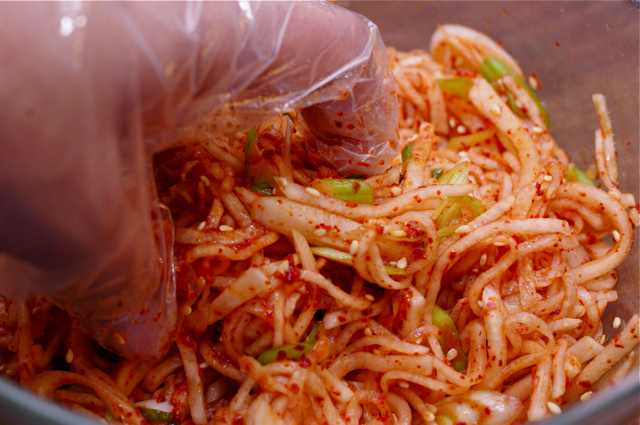 Don’t forget to make the “Chili bibim sauce” to go with! To assemble: Place hot rice in a individual serving bowl, then arrange Namools in contrasting color manner. Dot with sauce, and put fried egg on top if you like. Tip #1: If you would like to eat as Dolsot Bibimbap (the sizzling hot stone pot), use any individual stove proof cast iron, stone, or clay pot. Just grease the pot with some oil, assemble the dish, and place on the high heat. You will hear the sound of rice sizzling in it. Remove from heat and serve asap. Tip #2: I know some people have trouble mixing the dish. Use chopsticks to toss all the vegetables and sauce with rice together first. Then use a spoon to finish up. I ate it all, every single one… and I ate it again for dinner with my family. I ate it next day as well for lunch. And I still crave my bibimbap. Just random words of the day. I happened to eat my Bibimbap when I was watching TV news. My thoughts and prayers are with the families of victims of Arizona gun shootings. My heart was aching to hear the death of a 9 yr old girl. She happened to have the same birthday as mine. 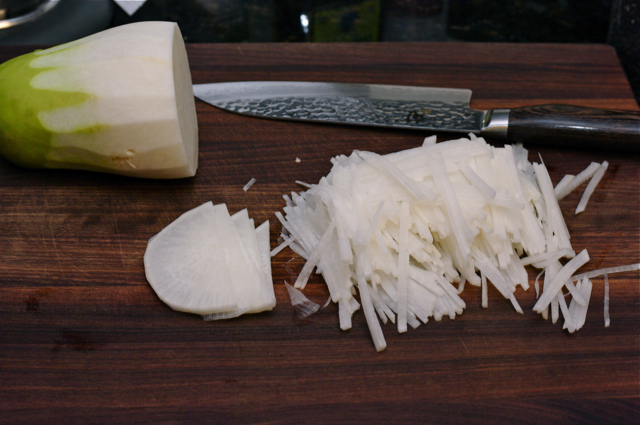 #1 : Peel radish, slice thin and cut them into 1/8" sticks. Place them in a mixing bowl, add 2 tsp salt and 2 tsp sugar. Toss and let it sit for 10 minutes. You will see some liquid extracted. Rinse the radish with water once and drain well. Place them back in the bowl and add its seasoning ingredients. Toss well and set aside. #2 : Cook the mung bean sprouts in boiling water for 3 minutes, drain and place in a mixing bowl. 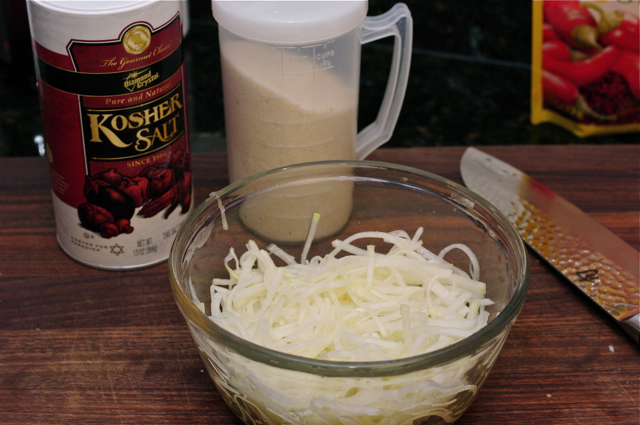 Add the seasoning ingredients and toss. Set aside. 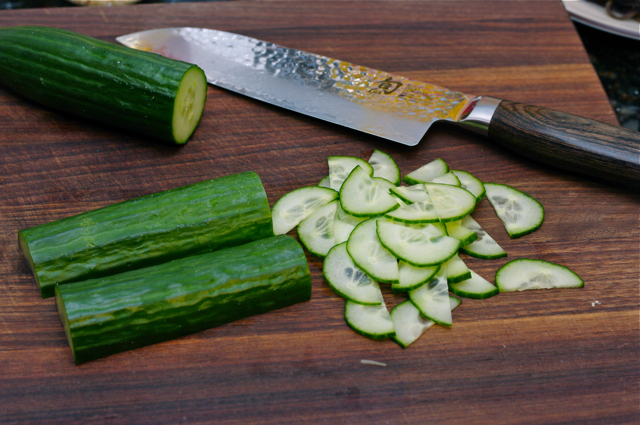 #3 : Cut the cucumber in half lengthwise and slice each half very thin half moon shape. Place them in a bowl and add 1 tsp salt and let it sit for 10 minutes. Rinse with water once, drain and squeeze out a little. Heat oil in a skillet over medium heat and stir quick, sprinkle salt and sesame seeds, for 1-2 minutes. Remove from heat and set aside. #4 : Cut zucchini into 2" logs. 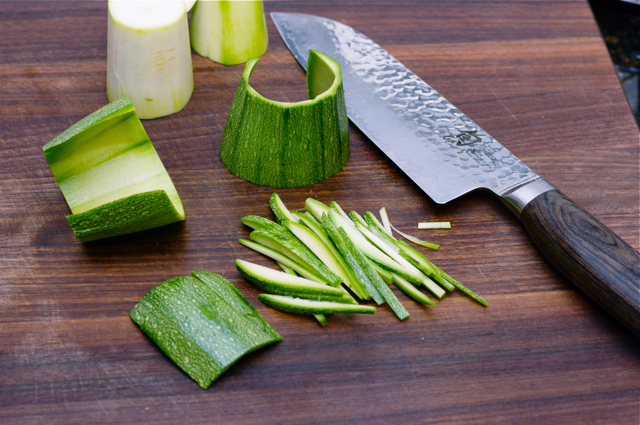 Using a knife cut off the green part around the zucchini from the side, discard the white part. (If you are not comfortable of doing this cutting, just use 1 whole zucchini) Slice the green part of zucchini into 1/4" sticks. 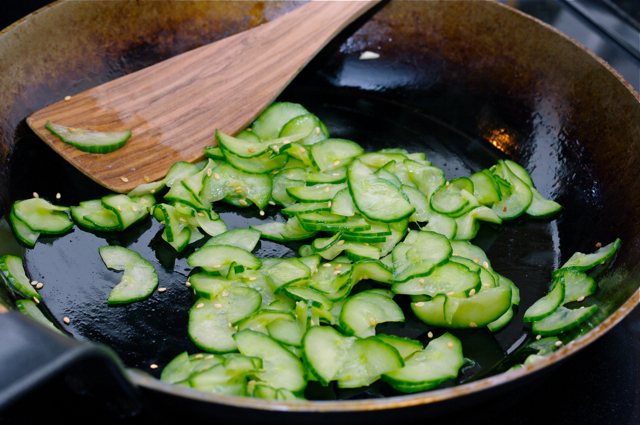 Heat oil, add zucchini and stir fry for 1 minutes. Add the seasonings and fry until it gets soften keeping the green color. 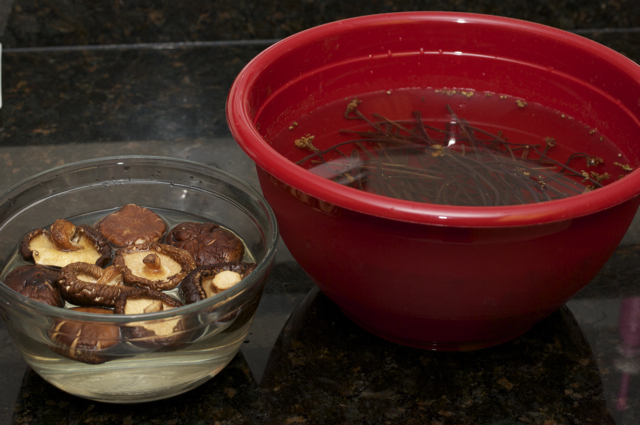 #5 : Soak the mushrooms in water for 2-3 hours. Remove from water and squeeze out excess water. Slice them thin and cook in the oil with its seasoning until soft, about 3 minutes. Set aside. #6 : Soak the fern in water overnight. Cook them in a simmering water for 40 minutes until it gets re-hydrated. Drain and rinse. Cut off the woody end part (about 2-3") and discard. Cut the fern 2" slices. Place the fern in a bowl and add Korean say sauce, garlic, sesame oil. Toss with a hand. 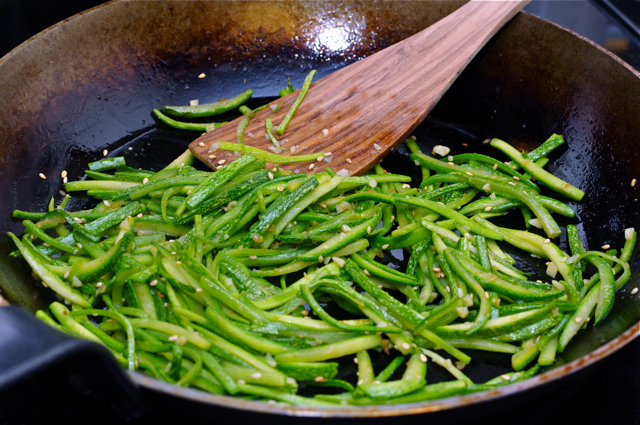 Heat oil in a skillet, add seasoned fern and stir fry for 2-3 minutes. Add sesame seeds and green onion. Set aside. To serve, place rice in individual serving bowl or pot. Arrange vegetables contrast in color manner on top of the rice. Place fried eggs on top and dot with sauce. When ready to eat, mix like crazy! Note: You can prepare each vegetables ahead of time and keep in the fridge. Bring to the room temperature before you serve. « Chili Bibim Sauce, doctor up! 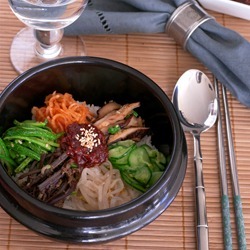 Yummy, I love bibimbap too! It's healthy, delicious and so nice to look at with the vibrant colors. It takes quite a lot of work to prepare though. That's why I usually eat it outside. But thanks for the gorgeous photos! Yes, it indeed is some work to make this dish. That's why I don't make that often, and If I do, it is to feed the company. I love this dish! Last time I had it was when I was in Korea which was 2 years ago. So, thanks for posting this. I will have to make a trip to the Korean store and make this. Thanks jade. 2 years is a long time not to have this bibimbap. Better make them soon! I just found you site. This is awesome. Thanks. Your overview answered a lot of questions and we can't wait to try..
i am so thankful for this site! I really need to make a trip to the Korean store. I love hearing the Korean language it is so awesome! Hi Kay Thank you for visiting my site. I hope you make a trip to Korean store and buy lots of god Korean stuff, and explore on Korean cooking. Do you speak Korean? I went to my H-Mart in New Jersey (I love them so much) and have everything to make this tonight! Brackens have been soaking overnight. My question: will namool keep in the fridge overnight? Namools can be stored in the fridge over a week. For the Brackerns, after the overnight soaking, cook in the water for 45-60 minutes until tender. Add a little bit of baking powder or sugar might help to tenderize them. Good luck and enjoy your hard work! Hi. Bibimbap has been an instant favorite eversince I was introduced to Korean food. 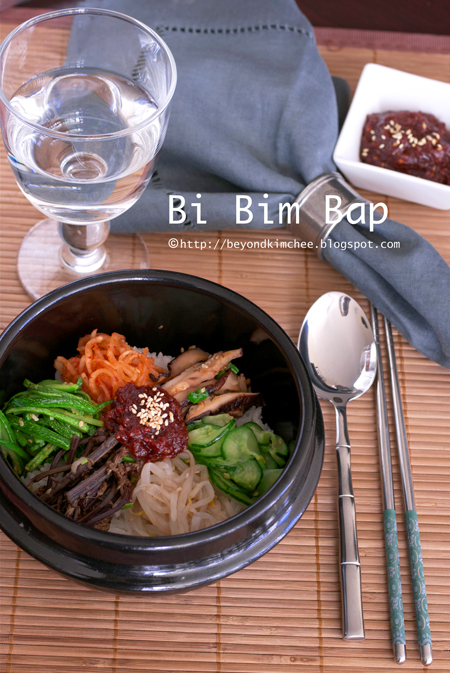 I was wondering, is there a way to have a simplified bibimbap? What about seafood bibimbap? Thanks. A simple, yet tasty Bibimbap we make is just rice in the bowl (sticky, short grain rice of course! ), a little high quality sesame oil dribbled over the rice, julienne japan cucumbers, Korean daikon, some blanched mung bean sprouts, watercress and choi sum - each seasoned with a little salt , sesame oil, garlic and pepper - topped with kochujang , some fine-chopped teriyaki rib eye ( just fry it up in a pan or grill),and a fried egg. you can realty go as simple as you want with the veggies, or leave out anything you dont like, To me, the real flavor i cant do without is the teri beef, fried egg ( not hard, over easy so some yolk runs out..yum!) . 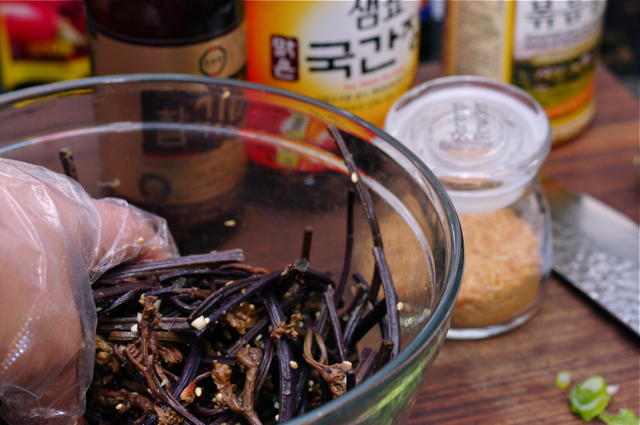 sesame and kochujang - it makes th3 dish in my opinion. My absolute favorite Korean dish! In Hawaii, we can get the fern ( we call warabi) quite easily ( the dried as well, but i like the fresh better) fresh, it has a nice crunchy texture. Love all Korean food - had the unusual experience of being he only Portugese boy working in a Korean restaurant for almost 26 years lol. The menu was a Hawaiian style localized Korean foods, but the food in the back f restaurant that the Korean owners cooked ...O MY!!! The Owners Mom cooked made every kinda of kim chee you can imagine , home made Korean miso paste, korean pickles ... everything. She is now 85 years old, and can still outwork ANYONE in that kitchen - amazing woman that cant speak a lick of English, but the sweetest, kindest woman I know. And man can she COOK!!. The owners husband would come out everyday, and make all kinds of banchan for everyone's lunch, and got me hooked on things like black spaghetti, ginseng chicken and spicy pork belly cooked with kochujang, a little dashi, bell peppers and onions and served over rice. Family would always come visit and bring persimmons, Korean mochi, and all the marvelous foods linked to the Korean holidays. I found my self hugely complimented when I was continually asked to make tofu and kimchee chigae, yook gae jung, seaweed and beef soups and other Korean specialties for the owners and family, and pregnant and/or sick women over the Korean workers !!! haha..was a very nice experience, becoming "adopted" to another culture - in Hawaii, ive experienced that with Japanese, Hawaiian, Filipino, Samoan and many other cultures - but Korean people had the BEST and most intriguing foods... except for the bottle of prepared fish guts my boss always brought to the table for her rice !! :D But my first love was always bibimbap. 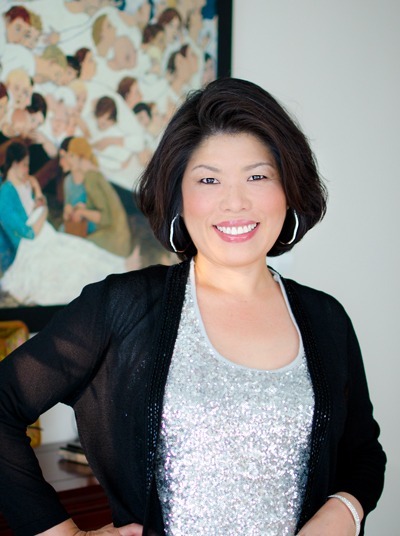 Great site, love all your recipes - thanks for sharing!! Wow, thanks Robert. I think you truly are a Korean food lover. I think Hawaii must have very good Korean restaurants. Lucky you that you get to try so many variety of Korean food. Thanks for you wonderful comments. Hi Sylvia I prefer Kikoman soy sauce over Chinese version. 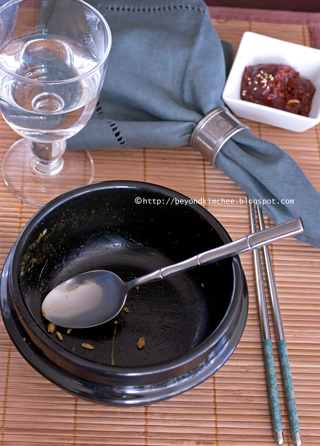 I am glad to hear that you liked the Bibimbap. Yum! 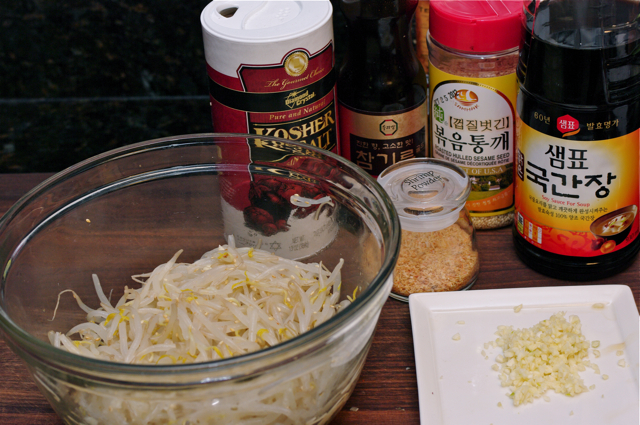 can you make bibimbap without onions or garlic? substitutes are okay, just not sure what if you can still make it. Hi Melody, you can omit the onion and garlic in the recipe. It will make the dish milder in overall flavor.